Home » Inspiration & things we love! » Date night with the Kids! Date night with the Kids! The ethos of modern life is that it is busy, hectic and full of activity and it’s a challenge to find time to connect as a family – really connect – switching off the outside world and just being in the moment as a family. Yet the rewards of investing in quality time together are endless, so my family has committed to making one night a month Family Date Night. We say goodbye to screens and other technology, instead using our imaginations, enjoying creative play and getting back to basics. On a monthly basis we look at the diary and see what’s coming up. We work out how much time we can set aside, pick an activity (or 2! ), agree a date and (most importantly) stick to it. If you’d like to enjoy your own Family Date Nights, I’d love you to try some of my five favourite activities and share pictures tagging #mykiddiewinkles! 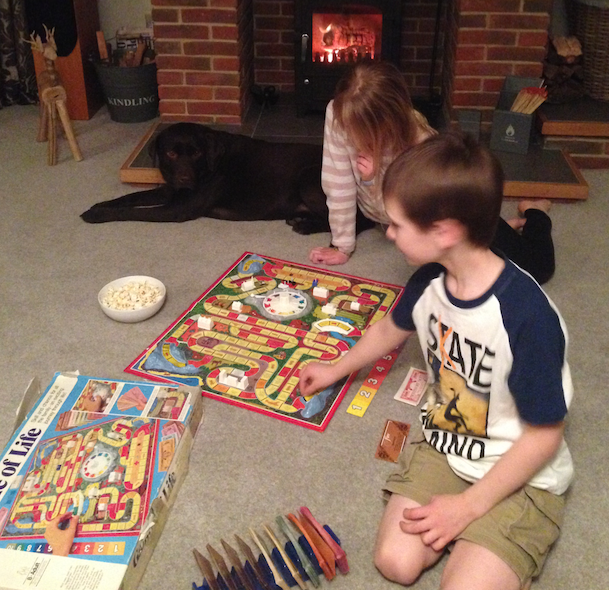 Games Night: Dust off your favourite board games and show the kids the games you loved playing when you were their age! Our top picks include Snakes and Ladders, Guess Who and my 30 year old Game of Life (old, brown sellotape included that holds the box together!). Camping Trip: If you already have a Kiddiewinkles Playhouse or Wigwam, use these to create a fort and bundle in together, role playing a night under the stars camping! If you don’t have one yet, you can work together to build your own make believe tent using chairs and blankets. Pop Stars: If you don’t own a karaoke machine, you still aren’t off the hook! Before Family Date Night, ask each grown up and child to suggest a song then create a playlist including them all. Sing solo or as a group if you have some shy singers! Fondue Fun: You don’t even need a fondue pot to enjoy these tasty treats! Simply melt some chocolate and cut up your favourite dippable fruits and snacks, then sit on the floor together and have fun! Why not challenge each other to tell the funniest joke, with extra choccie for the winner! Cook Off: Use a good old fashioned recipe book to create a delicious dinner you can all enjoy together. We love fajitas and homemade pizza, as both are fun to make and easy for little hands to help with. Take a look at our Cooking with your Kiddiewinkles Blog Posts for inspiration! If you have any other Family Date Night ideas you’d like to share, we’d love to hear them! You can find us on Instagram, Twitter and Facebook by searching @mykiddiewinkles.